Group healings are one of my favorite things to do - so much so that I've been offering them on and off over almost 3 years! During the months of October and November, I will be offering group healings to honor the energy of the full moon and the autumnal energies which can be powerful portals of release, shadow energy, and transformation. - You purchase the healing under your name and you will automatically be included in it when I do it for each healing you purchase. In the notes, when you check out, please include the email where you would like the healing PDF sent to. 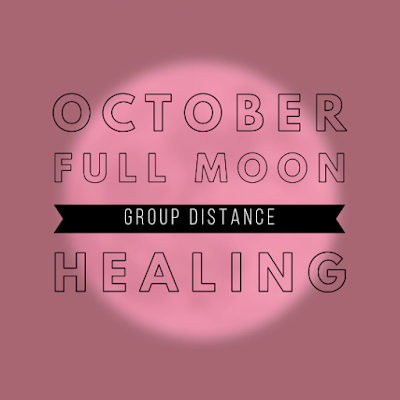 - On the day of the full moon, when I feel guided, I will create a safe healing space for distance work, call in the energies and the guides, and perform a healing on the group - the exact ways and themes of which I will not know beforehand! It's all guided by the group itself and what the group needs. - While it is a group healing, the healing work itself is performed on you as an individual. It is not *individualized*, everyone receives the same healing, catered to the needs of the group. - During and after the healing, I take notes, type up what was healed, the theme of the healing, what collective themes and energies I saw and felt during the healing, and any additional messages from spirit and THIS pdf is what I send you in within 24 hours of the healing. I perform a release ceremony after each healing, as well. No cards are used in this healing unless I'm guided to use them. If I am, I will include a picture of the card in the PDF file. ** When making your purchase, please use the NOTES section to provide your FULL NAME and EMAIL ADDRESS where you'd like me to send the healing. The healing notes will be sent to the email address you provide within 24 hours of the 24th- don’t forget to check your spam folder! The fall energies are deep times for root chakra work which means the bringing up of fear, scarcity, uncertainty, and shadowy themes in your life. Aligning healing work, like this group distance healing, with the full moon and doing it frequently can assist in the transformation of these energies and ease your transition through them. Plus, it's kinda neat to hear the themes that are coming up and how they resonate with what you're walking through! You will receive a PDF file with the written notes from the healing within 24 hours of when it's performed. There's nothing else you need to do after signing up. If you got an email confirmation from PayPal, you're in! No need to be present for the session. I will compile the names of everyone the day I perform the healing and send out an email within 24 hours with the write-up!